Dental Implants Are They Right For Me? 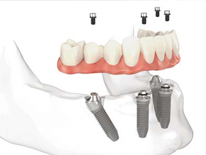 Implants are the natural looking and feeling tooth restoration option. We want you to relax in comfort during your appointment. We offer sedation options! Don't be embarrassed by slipping dentures! Implant dentures let you eat and speak normally! When you are seeking treatment for gum disease or need a periodontist for periodontal plastic surgery, set up a consultation with Dr. Frederick Olden. Dr. Olden is one of only a few periodontists in the area to offer laser surgery for the treatment of gum disease. Patients of Dr. Olden enjoy fast healing times and exceptional results because of the advanced periodontal treatments currently available. Dr. Olden and his team address patient concerns with a customized approach and work hard to tailor treatment plans to the individual needs of each patient. Whether you have lost teeth in an accident, have gum disease that needs to be treated, or you are looking for tooth replacement options, you can count on Dr. Olden to provide the best possible treatment and guide you through the process. During your first visit with Dr. Olden, you will gain an understanding about his approach to the treatment of gum tissues and the innovative options offered in his practice. You will learn why he prefers laser surgery over traditional gum surgery techniques, and how effective laser gum surgery can be for treating gum disease and other periodontal issues. Dr. Olden will take the time to learn about your oral health and general health history, perform a comprehensive periodontal exam, and create a treatment plan that will restore your beautiful smile. You will receive a breakdown of costs and a proposed timeline for the treatments that Dr. Olden recommends during the very first visit! When you are looking for an experienced periodontist in Rockwall, TX, call Dr. Olden for your consultation. Dr. Olden is among the few periodontists to offer laser gum therapy in Rockwall, TX and can treat of all your periodontal care needs. Complete the form below and we'll call you back at a more convenient time! Don't forget to visit our Special Offer's page to learn about potential discounts you may qualify for!